Assemble at Singapore Changi International Airport. 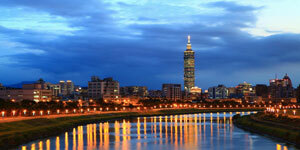 Your vacation begins with a pleasant flight from Singapore to Taipei, capital city of Taiwan. Upon arrival at Taoyuan International Airport, you will be welcomed by our guide. Yangmingshan National Park: Yangming Lake, Lotus Pool and the Flower clock are the favorite spots in the National Park. And it's one of the most important places for admiring the beauty of flower because of the blooming season. 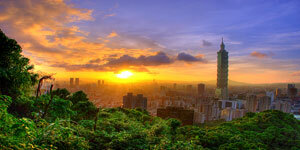 Being so accessible and close to Taipei City, the park attracts a very large number of visitors every year. Yehliu: The natural rock formations of Yehlin (wild willows) are an amazing array of artistic shapes created by erosion and other natural forces. Chiufen: To see the LD fashioned way of life that still exists. With the aura of an old mining that still apparent. Here you can also try some famous local dish as is Taro and Sweet Potato Ball etc. Nantien Temple: It's the landmark of Nafanau and also the center for the traditional religion of the local citizen. 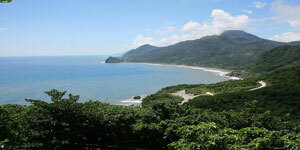 Ami Aboriginal tribe in Hualien. In this cultural center, you can see A-Mei people's unique life style and enjoy delicious A-Mei cuisines. Taroko National Park: The fourth National Park, Taroko Gorge I sufficient view disdain for the world the geographical landscape. Taroko Memorial Arch Building: It's designed in Chinese style. 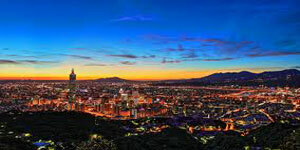 Eternal Spring Temple: Situated on the valley with the beautiful scene. Lu Yeh River Travel Season Hot Spring: Keeping in good health healthy hot spring its characteristic is the hot spring takes from the underground stream, with is the carbonic acid hot spring with the red leaves hot spring. Tastelessly to be limpid may drink, after malingers does not need to shower, wipes dry then is high quality soaks the hot spring. Master Bear Resort: There are many facilities, include Golf driving range, Kala OK, and evening can put the heavenly light to pray. 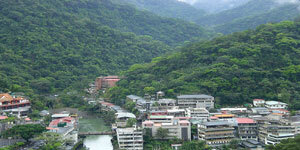 Fo Guan Shan: It is the center of Buddhism in southern Taiwan. Mei Non Hakka Village: You have the chance to see the traditional Hakka Handicrafts, such as hand-make umbrella, bamboo handicraft…..ext. Also you can pay for taste some Hakka traditional food, such as Ban Tiao, Ice block and Le Tea. Spring and Autumn Pailions: Where you will be amused by gigantic statues of Dragon and Tiger Pagodas, Hsuan Tien Shangti Temple. 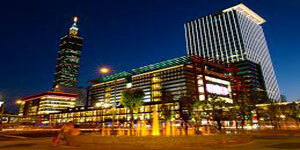 Dream Shopping Mall: the Southeast Asia biggest shopping center, the open-air in street is the water the characteristic and he visual platform happy canyon. Alishan: The famous views in Rise. Alishan Forest Park: Alishan is not only the most famous tourist spot in Taiwan, but he most popular travel destination for overseas tourist spot in Taiwan, but the most popular travel destination for overseas tourist outside of Taipei city. Alishan's beauty is natural with living creatures, especially the grant wood, like Three Brothers, Four Sisters….. And also famous temple 'Sho Cheng Temple' here for visiting. Tilun Tonpo Hot Spring: Nantou, a big tour country in Taiwan not only has rich recreation tour resources, but also has beautiful and comfortable scenery. Tonpo is famous for the groundwater (hot spring). Tourist can also relax here to enjoy the Indoor & outdoor SPA Hot Spring facilities in the resort. The resort is also surrounded unexplored forests, the unpolluted fresh air, clear creeks and the untouched wild animals. Sun Moon Lake: The largest lake in Taiwan. There is an island called 'Guang Hua Island' in the middle of the lake. Northern part of the island, looks like a sun, southern part look like a moon. That why called Sun Moon Lake? Peacock Garden: There is a garden swarming with peacock. Wen Wu Temple: The temple to enshrine and worship Confucius, Guan Gong and Yue Faye. 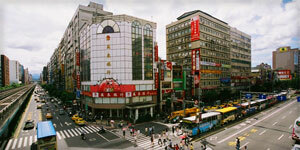 Earthquake Museum: To commemorate the earthquake of 921 in Taiwan. There's a lot of information about earthquake and something related about the terror earthquake of 921. Fong Jia Night Market: This is the night market which near by the Feng Chia University. You could not only shop for the low-price cloths, but also try the local food. Marty's Shrine: To view an elaborate ceremony of changing guards hourly. 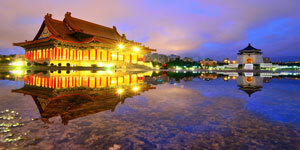 National Taiwan Democracy Memorial Hall: Is the most impressive monument to the great Chinese Hero. The hall's enormous marble adifice towers over landscaped garden, graceful pavilions and placid ponds. The bronze statue of late President Chiang Kai-Shek looks out over the city from the main building. National Palace Museum: The world's largest assemblage of priceless Chinese art treasures, one which spans Chinese's nearly 5,000 year history. 101 Shopping Mall: enjoy you're shopping in the tallest building in the world. Shihlin Night Market: Great place of local handicrafts, cloths, toys, tasty local snacks and souvenirs. Overnight stay in Taipei Riverview (or similar 4). After breakfast, you may do your last minute shopping/sightseeing before your flight back to Singapore. Parkview International Buffet, Ah Mei Aboriginal Feast + Bamboo Rice, Taitung Master Bear Meal, Abalone and Lobster Meal, Abalone and Lobster Meal, Tonpu Plum Specialty, Five Cent Driftwood House, Xiao Long Bao.